The above statement, if said in reference to the slaughter of Jews in concentration camps by Nazis, would be illegal in most European countries. Individuals like David Irving, who have claimed that “disease” not homicidal gas chambers, killed the victims of Auschwitz and other concentration camps, have been fined and imprisoned. Claiming pure intentions on the part of the Nazis, revising the statistics on their atrocities, and purporting that those who say otherwise have a “hidden agenda” is simply deemed to be unacceptable in reference to the Nazi holocaust. However, the above passage, said on national prime time television in the United States, was not said in reference the crimes of the German Nazis. It was said by Dinesh D’Souza, popular US conservative commentator, in reference to crimes against Native Americans by the white settlers of North America. The slaughter of the indigenous peoples of North America, like the slaughter of Jews by the Nazis, is very well documented and un-disputable. In places like Gnaddenhutten, Wounded Knee, and Camp Grant, mass slaughters of indigenous men, women, and children were carried out. A string of historical incidents, each more shocking in its details than the last, can be pointed toward as crimes against humanity. The callous inhumanity inflicted on the indigenous peoples of North America shocks the minds of any moral individual. For example, in one instance the slaughter of indigenous pre-pubescent children was justified by US military official John Chivington with the phrase “Knits make lice.” Since the initial genocide, the indigenous peoples were forcibly relocated to reservations and largely remain there, living in horrendous poverty. Under the slogan “Kill the Indian, Save the Man”, a cultural genocide was carried out. Until the 1960s, Native American religions were outlawed, and indigenous children were forcibly abducted from their parents and sent to schools runs by the United States Bureau of Indian Affairs. At these schools their languages were forbidden and they were indoctrinated with Christianity. The fact the crimes against the native people amounted to genocide is not disputed among historians. All across the planet, it is largely treated as fact. Dinesh D’souza, who denied the genocide of Native peoples on national television, practices basically the same activity as Holocaust revisionist historian David Irving. He has denied the slaughter of innocent people because it does not fit with his pre-conceived view of the world. D’souza panders to an audience of elderly conservatives, who want to believe the US is the “greatest country in the world” and cannot accept the reality of its atrocities, even those committed centuries ago. Much like Irving’s much smaller audience of fanatical anti-communists and Hitler worshippers, many FOX news viewers will happily buy each of D’souza’s books, and watch his film “America.” D’souza and Irving reassure their audience of the false historical delusions that they desperately want to keep believing. In order to believe in the absolute morality of the Nazi state, it is necessary to tamper with the historical narrative of the holocaust. In order to believe in the absolute morality of the United States, it is necessary to tamper with the historical narrative of the slaughter of native people. D’souza is not alone. Holocaust revisionism, in which the established narrative of atrocities is tampered with for political purposes, is a big trend in modern US politics and media. The campaign is increasingly prevalent in media and the rhetoric politicians in the context of efforts to justify US foreign policy, and whip up hostility against Russia. Jonah Goldberg, a conservative writer associated with National Review Magazine, has practically made a career by re-writing the historical narrative of the Nazi holocaust. Golderg’s Holocaust Revisionism consists of revising the historical reality of who the Nazis were, in order that certain political entities not be tainted with their memory. Goldberg attempts to purify western capitalism and its hardline defenders in the right-wing, by presenting the Nazis as “leftists” and “socialists.” Goldberg’s hope is to absolve the racist, hardline, empire building “right-wing” of any responsibility for the events that killed 14 million innocent people. Goldberg presents the holocaust, not as a crime associated by extreme defenders of imperialism and tradition, but as somehow a crime of the political left and progressive movements. Goldberg’s arguments, presented in his book “Liberal Fascism” and his many TV appearances, are frivolous and silly. He focuses on Hitler’s vegetarianism, or alleged involvement in mystical religion. He takes quotations out of context. He has claimed that alleged statements from the German Communist Party such as “First Brown, Then Red” or “After Hitler, Our Day” amount to an endorsement of Nazi politics. This is an absurd interpretation. Firstly, it is disputed whether or not the German Communist Party (KPD) actually officially made these statements. Leon Trotsky holds them up in his condemnations of the German Communist Party and the policies of the Communist International after 1928, but defenders of the KPD question them. Regardless, what these statements represented actual KPD policy, what they were said to mean was the opposite of an endorsement of Nazism. The KPD at the time was extremely hostile to the German Social-Democratic Party, who they called “Social Fascists.” They allegedly argued that it would be better for Hitler to take power, than the moderate socialists. The argument was that Hitler would make things worse, and drive more Germans to embrace the revolutionary politics of the Communist Party. They argued that Social Democracy was more dangerous with its deceptive consolation. “After Hitler, Our Day” was based on concept commonly called “accelerationism.” It expressed the idea that Nazi fascism was so extreme and brutal, that it would spark a class battle. Critiques and analysis of the Communist International’s politics during the “Third Period” of 1928 to 1935 are widespread among leftist activists, historians, and analysts. However, none allege that the Communist Party and the Nazi Party had any feelings of admiration for each other. The stated goal of Nazism was to “rid the world of Bolshevism.” On the streets of German cities, Nazi brownshirts battled against the KPD’s Red Front Fighters League on an almost daily basis. Goldberg’s claim of Pro-Nazi sentiments among German Communists is completely false. It is true that the Nazis copied a great deal of the propaganda and rhetorical methods developed by the Communists and Social-Democrats. It is also true that they sometimes raised similar grievances against the existing social order. However, the message was completely different. The German Communist Party blamed the woes of post-war Germany on the wealthy German industrial capitalists, and the bankers in Britain and the United States. The Nazis and other sections of the extreme right-wing blamed the woes of Germany, not on capitalism or the rich, but on the prevalence of Marxism, an alleged lack of patriotism and national unity, and some kind of secret conspiracy by Jews. These analyses of German society and woes are incompatible with one another. One analysis calls for restoring the past, by purging society of ethnic groups and reforms. The other calls for the destruction of the existing society, and the creation of an entirely new one based on egalitarianism and the abolition of private property. Goldberg’s work ignores Hitler’s popularity and support from the right-wing throughout the western world. He ignores that Henry Ford, the right-wing industrial capitalist who smashed unions, was given an Iron Cross by Hitler for his services to Nazism. A list of Hitler’s international allies and supporters reads like an encyclopedia of 1930s conservatives and right-wingers. It includes King Edward the VIII of Britain, “Radio Priest” Father Charles Coughlin, patriotic air pilot Charles Lindbergh, anti-Communist columnist Elizabeth Dilling, and L’oreal cosmetics tycoon Eugene Schueller. The chair of the “America First Committee” was Robert E. Wood, the CEO of Sears, Roebuck, and Company. Famed architect Frank Lloyd Wright attempted to join the “America First Committee” but was denied due to his “reputation for immorality.” Future Republican President Gerald Ford was also a member of the America First Committee while he attended Yale Law School. Charles Lindbergh, the most outspoken “America First” sympathizer wrote for the conservative magazine Reader’s Digest. In one article he proclaimed: “We can have peace and security only so long as we band together to preserve that most priceless possession, our inheritance of European blood, only so long as we guard ourselves against attack by foreign armies and dilution by foreign races.” How are these words in any way consistent with the anti-racism and “political correctness” that Jonah Goldberg bemoans on in his thunderous tirades against the left? It is hard to argue against someone who holds such extreme assumptions. But why is such a concept now part of mainstream discourse? Jonah Goldberg’s book “Liberal Fascism” was widely promoted, not just among the extreme right-wing, but on even mainstream television. Liberal comedian Jon Stewart interviewed Goldberg on his widely viewed television program. Like David Irving, Jonah Goldberg is essentially re-writing the events of the holocaust to serve a political end. However, Goldberg’s work, making outrageous historical claims, has been given legitimacy by the US media. While liberals may loudly argue against it, they consider it to be part of respectable discourse. The idea that somehow Nazism and Fascism are just another wing of Socialism and Communism is not considered laughable, or absurd. Its considered worth discussing and debating. The revisionism goes beyond Jonah Goldberg and Dinesh D’souza’s attempts to retell how atrocities were carried out. The manner in which the Nazi holocaust was ended and its perpetrators defeated, is also another field of revisionism. The fact that the Soviet Union was decisive in defeating Hitler, is being marginalized and forgotten. While ranting against film-maker Michael Moore for an alleged lack of patriotism, FOX news host Bill O’reilly proclaimed, on June 28th, 2004: “…This is the United States, who has freed the world from communism, freed the world from fascism, from the axis powers, freed the Pacific from Japanese…” Bill O’reilly recently published a book called “Killing Patton” that alleges that the Soviet Union assassinated this US military official. North Dakotan Senator Heidi Heitkamp bemoaned the lengthy congressional negotiations saying that a “decision has taken longer than it took us to defeat Hitler.” However, all of these statements belittling Soviet military achievements, pale in comparison to a recent event in Europe. At the 2015 Holocaust commemorations at the site of Auschwitz concentration camp, one world leader was barred from attending. Vladimir Putin, who presides over the Russian Federation, was not allowed to be present at the commemorations at Auschwitz, even though it was troops from the Soviet Union that liberated the camp. Western historians and politicians are doing all they can to subtly, and sometimes blatantly erase from public memory that the Soviet Union bore the brunt of the fighting against Adolph Hitler. 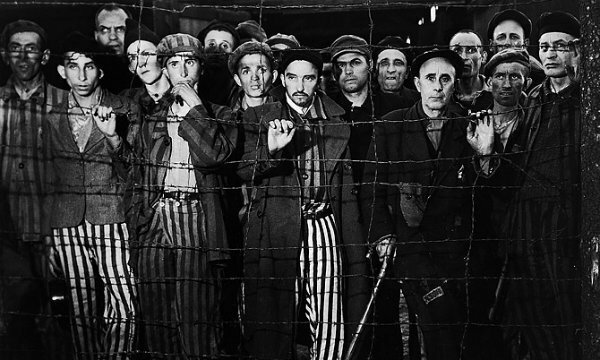 Auschwitz and other concentration camps were liberated by Soviet Troops. 26 million Soviet citizens perished in the fight against Hitler. In fact, the US did not land in Normandy until the Soviet Union had already turned the tide of the war. With the Soviet Union marching inland toward Berlin, the US entered the European theater, fearing that all of Europe would be liberated by Red Army tanks. The heroism of the Soviet Union, which included the Russian Soviet Republic, in defeating the Nazis ending the holocaust cannot be ignored. Yet, it is being re-written, to serve political purposes in the 21st Century. The USSR called for a “World Alliance Against Fascism” as early as 1934, only to be rejected by the western world. Anti-fascist resistance groups in Germany, France, and Italy were led by Communists. Communists raised funds for the Spanish Republic as it fought fascists, and thousands of young Communists from around the world travelled to Spain forming International Brigades to join the fight for democracy. Prior to the Second World War, the Soviet Union was the only country to aid those who fought Nazi allies in Spain. Underground resistance fighters who faced firing squads in Germany and fascist occupied territories, often raised their fists into the air and shouted “Stalin!” before being shot down. The contribution of the Soviet Union and the global communist movement to the allied victory in the Second World War is immeasurable. Yet, the Holocaust Revisionists who dominate US discourse, have attempted to re-tell the story of Hitler’s defeat. They belittle, deny, or attempt to discredit the Soviet Union’s heroic sacrifice to defeat Hitler. Books like “The Devils Alliance” attempt to cast the 1939 Molotov-Ribbentrop Pact as an alliance between the USSR and the Nazis. Books like Dr. Timothy Snyder’s “Bloodlands” go as far as to claim that the Soviet Union killed more innocent people than the Nazis. Hillary Clinton’s outrageous comparison of Vladimir Putin to Adolph Hitler was understood by the world to be highly offensive, due to the millions of Russians and other Soviet Nationalities that perished in the Second World war. Yet, to the US public, who have endured decades of misinformation, it seemed to make sense. To so many people in the United States history has been simplified so that Hitler is another one of the “bad guys” who was “against America.” If Putin is now portrayed as such on 24 hour cable news broadcasts, why not compare him to Hitler? The outrageousness and offensive nature of such comparisons has been buried under pages of holocaust revisionism and Russophobic anti-Communist scholarship. Some may think that events of the 1930s and 40s bear little relevance to current events. They are wrong. Bookstores throughout the United States have shelves filled with books pushing revisionist tracts from various scholars. Major US publishers push a unified narrative about the “Soviet Empire” that “slaughtered hundreds of millions.” The phrase “Stalin was worse than Hitler” is often repeated on television without challenge. This all serves a very real political purpose. The author of one Anti-Communist historical tract, Timothy Snyder, has suddenly found himself in the public eye, far beyond the University lecture halls. Snyder uses his historical work to justify the US support for the Kiev Junta. Snyder’s mythology proclaiming “Stalin was worse than Hitler” seems to make Poroshenko’s shelling of civilian areas seem understandable. Who are the allies of the United States in Ukraine, Eastern Europe, and even within Russia itself? They are crazed anti-communists. They are admirers of Hitler. They are fanatical racists. They are advocates of neo-liberalism, the direct rule of western banks, and expansion of NATO. They are peoples hated by their respective populations, but loved as obedient servants of Wall Street. And who are the forces of resistance? They are Communists and socialists, standing alongside nationalists who speak against capitalism. They all recall the Soviet era with pride in its achievements, and speak with open contempt for the western bankers who sit on top of the world, and once threatened the USSR with nuclear destruction. In this global context, of rising hatred for Russia, and the rise of political repression and economic crisis in the west, the prevalent campaign of holocaust revisionism makes sense. 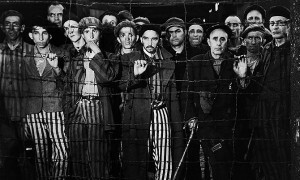 The actual story of the holocaust is the story of tyrants rising to power on a platform of crazed anti-Communism and promises to restore “law and order.” It is a story of private corporations making billions and billions of dollars from slave labor, while “restarting” the economy with rampant militarism. It is a story of military expansionism and aggression covered up with lies and false claims of victimhood. It is the story of a global financial crisis, when an increasingly impoverished population was misdirected to scapegoat certain ethnic groups, and not to challenge the system responsible for deteriorating conditions. In addition to its horror, in the actual, un-censored and un-revised events of the Second World War, we also see another story. It is a story of resistance against injustice, amazing feats of courage in the face of deadly terror, and amazing acts of sacrifice. It is a story in which the peoples of the United States, Britain, Russia, and China are not deadly enemies, but friends, united against fascism. It is a story in which the most self-sacrificing, and fearless resisters to tyranny and genocide, are not defenders of free market capitalism, but self-proclaimed Marxist-Leninists, who take direction, not from Washington, but from Moscow. The actual historical record of what went on during the holocaust is repudiation of the motivations and of the very system currently championed by the rulers of the United States. No wonder they work so hard to rewrite it, as they move frighteningly toward a new world war.